Discussion in 'Standup Technique' started by CELS, Aug 7, 2015. I'm a total ignoramus when it comes to boxing, so apologies for what is potentially a white belt thread. One thing I've noticed about Conor McGregor's boxing is his stance. I don't recall seeing anything like it. I don't understand how he makes it work. He has a really long stance, a huge distance between his feet, and he stands really sideways. His cross has to travel a long way before it hits its mark, but it's possibly his most powerful weapon. So what do you call it? Who came up with this stance? Are there any boxing originals I can study to learn more about how it works? I guess it's similar to the Crab, in the simple fact that the feet are pointing more sideways rather than towards the opponent. But where Mayweather's Crab is fairly upright and short, McGregor has a really long stance, like something you would see in taekwon-do or karate. It's a Karate stance (or at least most Karate like). He's been boxing since he was a kid, but that's not what his style or stance reflects. Conor McGregor's background is in boxing, but he's also done freestyle kickboxing (no low kicks) and he now trains a lot of Taekwondo. His stance is pretty long and I think that likely reflects his TKD training but it's his boxing skills which are why he's as good as he is. Can't claim to know all the ins and outs of his regime, it was just what I was reading in a magazine that he did an interview in. So you don't really see long stances like this in boxing? There's a lot of people with karate and TKD background doing kickboxing and MMA, but you rarely ever see people adapt that stance to boxing the way Conor does it. Since he has an extensive background in boxing, I figured he found a style of boxing that matched his TMA background. Could you point me to a boxer with a long stance? I've seen Roy Jones Jr occasionally drop into a long stance, but he's very fluent and inconsistent, he mixes between different stances, it seems like. Erislandy Lara came to mind first. It's not very karate like or anything and he's a different style but he does have a wide , turned stance, southpaw, and has a sharp long cross. Pauli Malignaggi has a wide stance. I also found interesting what Teddy Atlas pointed out in Pauli's last fight. Because of his long stance he always has to lead with the "wrong" foot so if he backs up he has to take a step with the lead foot backwards first because his stance is so long he can't move conventionally if he has to move fast and that's why he gets hit when he tries to back up. David haye has also a long stance and he also often has balance problems when he has to move forward while attacking and people who press him backwards gave him trouble even in fights he won he coudln#t get away from them like a boxer with a narrower stance could. Erislandy Lara has already been mentioned, but Guillermo Rigondeaux fights quite wide too, so does Floyd Mayweather, none of them stand as wide as McGregor. That being said, the balance of McGregor and the three boxers I mentioned is fantastic. In order to not get clipped in the back of the head repeatedly, most boxers don't adopt this stance. Also, to make it work, you have to have exceptional vision, and some phenomenal speed &/or reflexes, or you will be getting nailed on a continuous basis. It is NOT a stance that would benefit 98% of the boxers. The distance between two opponents in MMA is significantly wider than it is in boxing, mostly because of kicks and takedowns... so McGregor has more time to move away from incoming salvos. He can get away with a longer stance than many boxers can. If you watch when Conor's first few fights, he was much more square. Than he started training with Gunnar Nelson in the striking department and he started adopting a longer, more bladed stance; it was especially prevalent during the Holloway fight. After that fight, he began training TKD and his stance is as you see it today. He has a TKD background. Yeah and quite a few Cubans have adopted this style. You see it more in the amateurs in general. As evidence look at this still of Amir Khan vs. Mario Kindelan from the Olympics. How often do you see that in the pros? Yeah it's interesting Pauli does this since he is a heavily jab reliant fighter and doesn't have much if anything of a rear hand so it makes sense he adopt a more 'fencing' style. He also has a karate background. It reminds me more of a modified kokutsu dachi backstance. It could just as easily be a modified TKD stance. In point of fact it's neither. It's something kind of like either of them. It's also not a single stance. If you google Conor McGregor stance you see a huge number of variations backstance, frontstance, centered... it's all very fluid with him. 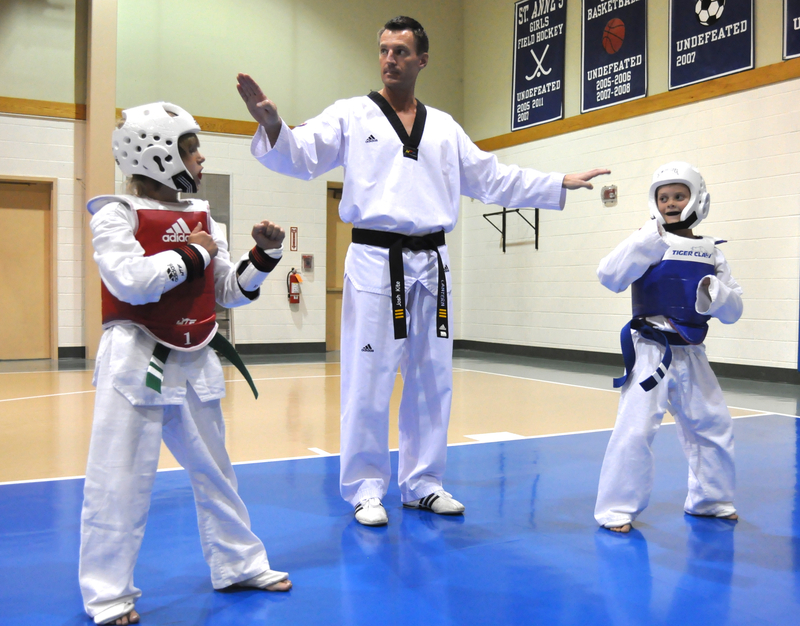 TKD doesn't stand in a wide stance for sparring because it makes their styles of kicks really hard. When the objective is pure speed, both in movement and snap kicks, you can't be in a borderline split. I think the myth comes from their "poses" and forms and what not. I realize these are children, but it was the first photo I googled up. This is a pretty typical Olympic TKD stance. Source: I've trained in ATA and WTF TKD as well as the sister style, TSD.